Polish Approved – Cookie Dough Popsicles! I’m freaking out right now. I just discovered a cookbook all about cookie dough! Cookie dough is my favorite part of the cookie so why shouldn’t there be a cookbook all about the best part of the cookie? Why shouldn’t you be able to make other things out of cookie dough besides just cookies!? Place milk in a microwave-safe bowl and heat for ~1 minute, or until warm to the touch. Stir in brown sugar and salt until dissolved. Stir in vanilla. 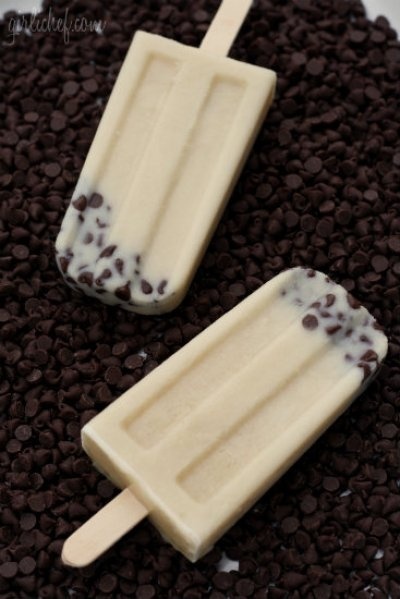 Place ½ tablespoon of chocolate chips in the bottom of your popsicle molds. Fill to the top with milk mixture. Insert sticks and freeze until solid.